﻿Published by Sareth Ney on April 19, 2016 at 11:44 a.m.
DAYTONA BEACH, FLA. - Summerland Tour’s one of two stops in Fla. will include Jester’s Live, on July 14. 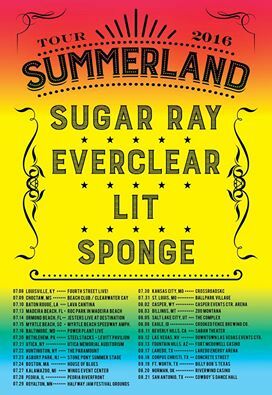 The tour will feature Sugar Ray, Everclear, Lit and Sponge. The expedition will begin at Fourth Street Live! in Louisville, Ky., on July 8. It will conclude at Cowboy’s Dance Hall in San Antonio, on Aug. 21. By clicking here, Summerland Tour’s website can be found. To like them on Facebook, please click here. Rodney Sheppard is the lead guitarist, Mark McGrath is the vocalist, rhythm guitarist and percussionist, Jesse Bovina is the drummer, percussionist and programmer and Justin Bovina is the bassist of Sugar Ray. Sheppard and Bovinas assist with backup vocals. Dean Butterworth and Kristian Attard tour with. To visit Sugar Ray’s official website, please click here. To like them on Facebook, please click here. To follow McGrath on Twitter, please click here. To subscribe to McGrath’s channel on YouTube, please click here. Art Alexakis is the vocalist and guitarist, Davey French is the guitarist, Freddy Herrera is the bassist, Josh Crawley is the keyboardist and Sean Winchester is the drummer and percussionist of Everclear. French, Herrera, Crawley and Winchester assist with vocals. Their roots are from Portland, Ore. Please click here, to visit Everclear’s official website. To like them on Facebook, please click here. To follow them on Instagram, please click here. To follow them on Twitter, please click here. To subscribe to their channel on YouTube, please click here. A.Jay Popoff is the vocalist, Jeremy Popoff is the guitarist, Kevin Blades is the bassist and Nathan Walker is the drummer of Lit. They are a rock band hailing from Fullerton, Calif. Their latest album, “The View from the Bottom”, was released on June 19, 2012. Lit’s official website can be accessed by clicking here. To like them on Facebook, please click here. To follow them on Instagram, please click here. To follow them on Twitter, please click here. To subscribe to their channel on YouTube, please click here. Vinnie Dombroski is the vocalist, Tom Patalan is the bassist, Billy Adams is the drummer, Kyle Neely and Andy Patalan are the guitarists of Sponge. They are a rock band from Detroit and are part of The End’s roster. Their latest record is “Stop The Bleeding”. July 09 - Beach Club/Clearwater Cay at Geyser Falls, Choctaw, Miss. July 10 - Lava Cantina, Baton Rouge, La. July 13 - ROC Park in Madeira Beach, Madeira, Fla.
July 14 - Jesters Live, Daytona Beach, Fla.
July 15 - Myrtle Beach Speedway Amphitheater, Myrtle Beach, S.C.
July 20 - SteelStacks - Levitt Pavilion, Bethlehem, Pa.
July 21 - Utica Memorial Auditorium, Utica, N.Y.
July 22 - The Paramount, Huntington, N.Y.
July 23 - Stone Pony Summer Stage, Asbury Park, N.J.
July 27 - Wings Event Center, Kalamazoo, Mich.
July 28 - Peoria Riverfront, Peoria, Ill.
July 29 - Halfway Jam Festival, Royalton, Minn.
July 30 - CrossroadsKC, Kansas City, Mo. Aug. 02 - Casper Events Center, Casper, Wyo. Aug. 03 - Zoo Montana, Billings, Mont. Aug. 11 - Saban Theatre, Beverly Hills, Calif.
Aug. 13 - Fort McDowell Casino, Fountain Hills, Ariz.
Aug. 20 - Riverwind Casino, Norman, Okla.